Born out of a closet dislike for “Shrek 2,” Criticker is a new movie review community and recommendation engine that aims to match users with like-minded individuals who share the same cinematic taste. Once you’ve rated 10 movies at Criticker it begins to form what they call a Taste Compatibility Index (TCI) that matches you up with not only other users, but also professional reviewers who share your taste in movies (though, I found that site really doesn’t start delivering usable results untily you’ve rated around 50 flicks). One of the most important features of the site is how painless they make the process of ranking first 10 films (or your next 100). While you can search out specific films and rank them one at a time, similar to any other movie community, you can also page through randomly generated lists of 10 films at once, ranking each on a 1-100 scale. I was able to rank 80 films in just about 30 minutes by going the random route. Certainly not all my favorite films were represented (I made sure they were ranked later by searching them out), but I did give the site a good sized sample to work with that covered both films I like and films I loathe. Had I been forced to search out movies on my own, my list likely would have been skewed toward mostly films I like — recommendation engines should in theory work better if they also know what not to send your way. After ranking your first 50 or so movies, Criticker begins to fill in your TCI with users and critics who have similar tastes based on mutual rankings. The more films you rank, the better and more accurate your matches will become — matches based on 100 rankings in common are bound to be more accurate than those based on 10. You can set a “films in common” minimum for Criticker to take into consideration when using your TCIs to power recommendations. I have mine set to the default of 10% (or about 8 films out of my 80+ rankings). That means that even though at the moment Jamie Levy of Variety is my top critic match, Criticker should ignore his recommendations for me because we only have 3 films in common. When Criticker makes a recommendation, it assigns movies a Probable Score Indicator (PSI), which estimates the ranking you would likely give the movie based on your past rankings the rankings of your TCIs. Based on critic reviews, the site is today recommending that I should go see “Into the Wild” with a PSI of 88, and based on users and critics the site is telling me I should rent “Casino Royale” with a PSI of 90. Those recommendations seem pretty accurate — “Into the Wild” has been on the top of the list of movies I am looking forward to, and I enjoyed “Casino Royale” (I haven’t rated it yet, which is why the site recommended it to me). Criticker is a nice site that makes rating a lot of movies fun and easy — I rated more in 30 minutes on the site than I have in 10 years of casual IMDb use. Their recommendation engine makes mostly good recommendations (with a few misses here and there), and the ability to tweak how it interacts with your Taste Compatibility Index to determine rankings means you can up the accuracy of ratings. 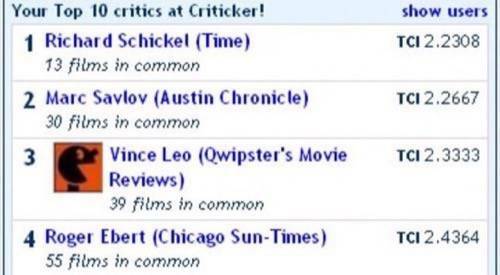 Unlike sites that recommend products based on what everyone thinks of them, Criticker recommends films based only on the opinions of people who have a similar taste as you, which makes a big difference. The lesson there may be that the crowd as a whole isn’t always smart (or at least isn’t well suited to every task we try to throw at it). However, more focused crowd intelligence can yield potentially exceptional results.